The Quebe Sisters Band from Fort Worth, Texas, headlined the Santa Clarita Cowboy Festival at Renaud and Andre Veluzat’s world-famous Melody Ranch Motion Picture Studios in Newhall, Calif.’s Placerita Canyon, packing the big main stage tent on both Saturday and Sunday, April 21-22, 2012 (left). 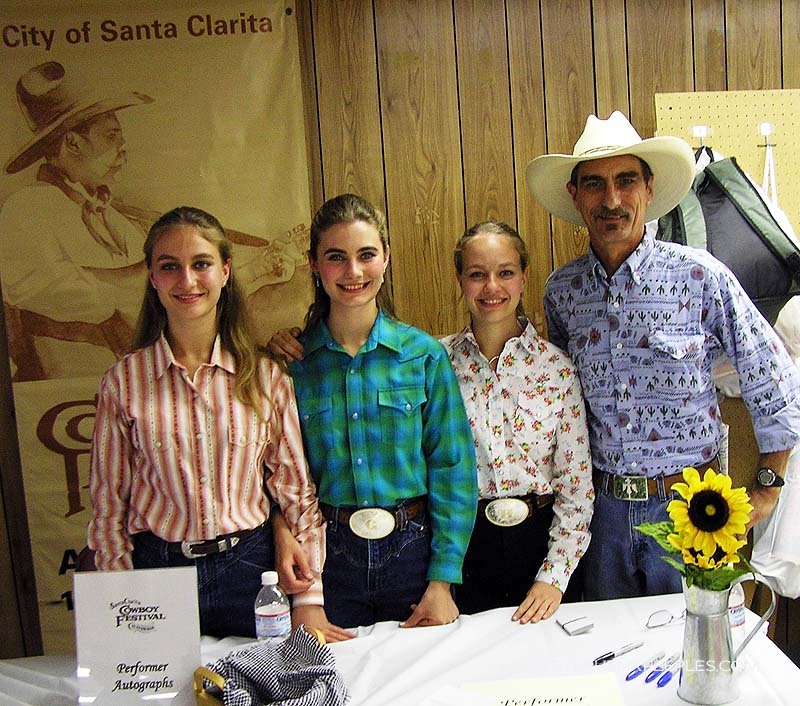 It was the group’s fourth appearance at the city of Santa Clarita’s huge annual roundup of all things Western. 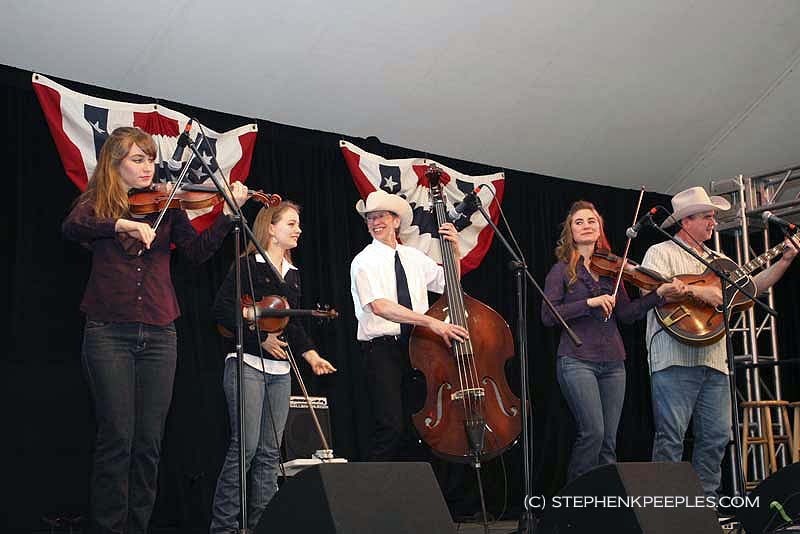 The triple-threat Texas swing fiddlers and singers Hulda (left), Sophia (center) and Grace (right), backed by their guitarist, producer, fiddle and vocal arranger Joey McKenzie (far right) and bass player Drew Phelps, performed tunes from the QSB’s first two albums, “Texas Fiddlers” and “Timeless,” and previewed tunes slated for their third album. Sign up for the Peeples Place at KHTS email alert. Get a heads-up on the latest post. 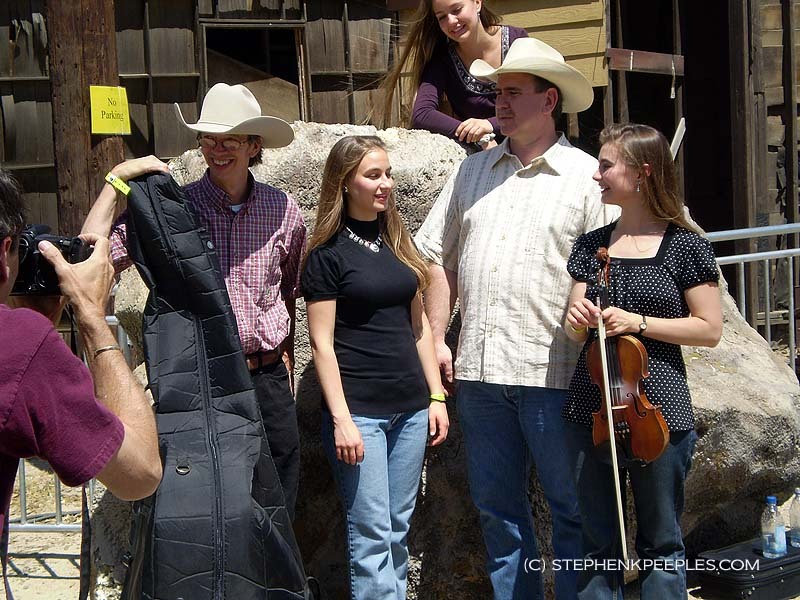 Mike Fleming, a veteran Western songwriter and performer who heads up the city of Santa Clarita’s Arts & Entertainment posse, books the Cowboy Festival’s musical talent each year, and brought the Quebe Sisters to the festival as unknowns to locals in April 2006 right). The quintet’s all-acoustic, neo-vintage synthesis of Bob Wills, the Andrews Sisters, Django Reinhardt and the Sons of the Pioneers blew everyone away, including yours truly, who first spoke with and wrote about as a reporter for the local fishwrap that year. So Fleming has booked them every other year since then. The Quebe (pronounced KWAY-bee) sisters and McKenzie, who also manages the group with his wife Sherry, enjoyed my initial profile story, and we’ve connected for subsequent pieces in (the newspaper not to be named) each time the Quebes have appeared at the Festival. This year, though, I interviewed them exclusively for Peeples Place at KHTS, posting the transcript here on KHTS’s market-leading, award-winning website, and the video on my YouTube channel. 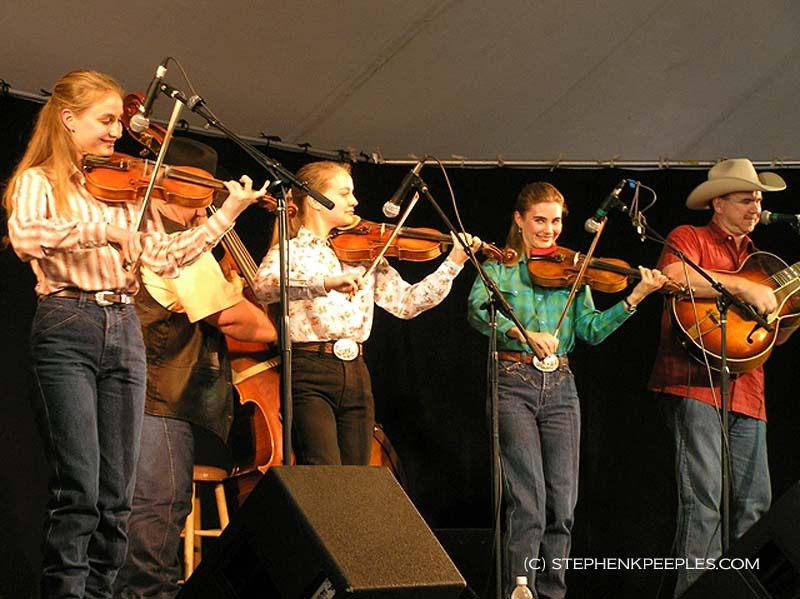 Joey and Sherry, both champion fiddle players and accomplished musicians, started teaching the sisters in 1998, when Hulda was 7, Sophia 10 and Grace 12. Under the McKenzies’ mentorship, the girls were soon winning fiddle championships in Texas and around the nation. 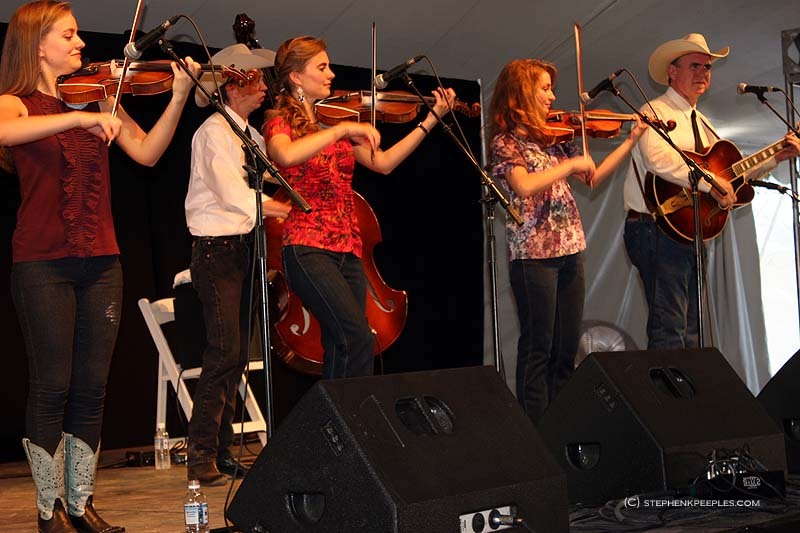 At first performing as an instrumental group, the sisters started singing in public in 2005, just a year before we saw them here first. Left: QSB photo session and interview with the author in April 2008. The author’s at far left in purple T-shirt. Photo: Unknown. 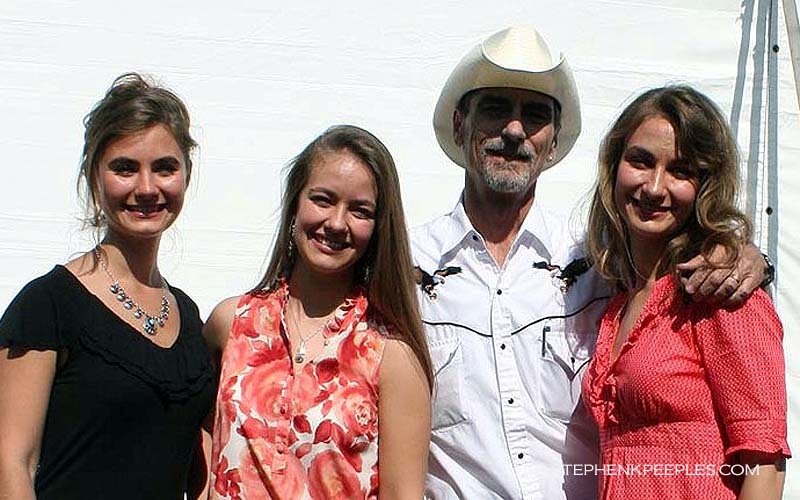 It’s been a real treat for us Texas and Western music fans in the SCV to watch these fine Lone Star girls grow into even finer young women in the last six years. Now 21, 24 and 26, Hulda, Sophia and Grace have shown continuous improvement as musicians and singers, expanding their repertoire into jazz, old-time music, bluegrass, cowboy classics and more, and breaking out of Texas to earn new fans around the world. In my four in-person interviews with them In that time, they’ve remained down-home, unpretentious, friendly and gracious, and haven’t lost a whit of their genuine enthusiasm for performing and interacting with their fans. 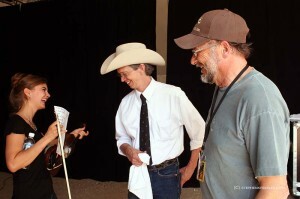 From a press standpoint, it’s always fun to interview them, even briefly, and I must say I love their Texas twang. 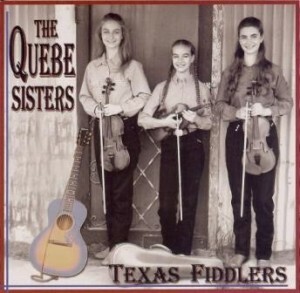 So all things considered, it’s not at all difficult to champion the Quebe Sisters Band, and if you’ve not heard them on disc or online or onstage, I urge you to visit their website and remedy that situation. After the band wrapped up its Saturday set on the Melody Ranch Main Stage, Grace, Sophia and Hulda joined my wife Nadine (also a major QSB fan since ’06) and me for a 10-minute catch-up session, standing in front of one of the ultra-rustic buildings just off Melody Ranch’s storied Main Street. 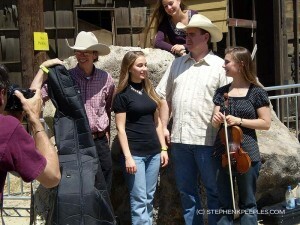 *****Stephen K. Peeples: We’re here at Melody Ranch Studios with The Quebe Sisters Band. Actually, just the sisters. You guys are here for your fourth appearance at the Santa Clarita Cowboy Festival, and just got off the stage. Sophia: Yeah, it’s fun. We’re so glad to be back. Peeples: Now, you’ve been really busy the last couple of years since you’ve been here last. Tell us about this last tour you were on. 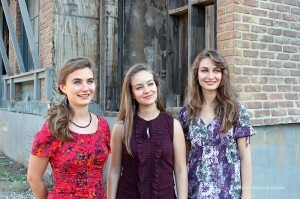 Sophia, Hulda and Grace Quebe on the backlot at Melody Ranch Motion Picture Studio in Newhall, California. Photo: Nadine A. Peeples. Hulda: “Don’t Fence Me In” was a lot of fun. It was a tour put on by the National Council for Traditional Arts, and there was an Indian pow-wow band that was on there, there was a Tex-Mex conjunto band, Los Texmaniacs, there was us, there was Wylie Gustafson, and we just had so much fun. We were on the road for about three weeks. Hulda: Yeah, Paul Zarzyski was on there. We were on the road with them for about three weeks, and we just had a blast getting to know the other musicians and learn about their styles and the way they do their music. It was a great experience. Grace: It was a representation of what Western music is today. Grace: Yes, exactly — contemporary Western bands playing. We started our in Washington state, went down to Oregon, and then made our way down the coast of California. Peeples: Now, you did get to play some places that you hadn’t played before, right? Hulda: Yeah, yeah. A lot of performing arts centers. Hulda: Oh, in Napa Valley. Sophia: That was really fun and beautiful. Grace: And we saw a redwood for the first time. Actually, none of us — see, a bunch of the bands were from other parts of the country, so most of us had never seen redwoods. So, they stopped the bus, we all got out and touched it, took pictures (laughs). It was fun. Grace: Exactly, it was! It was like the same experience. Peeples: You also went to Europe a couple of years ago, and then you just went to Scotland recently. You were telling some stories on the stage that were pretty funny. My family’s actually from Scotland, so that’s very cool. So, what was it like over there? I’ve never been…. 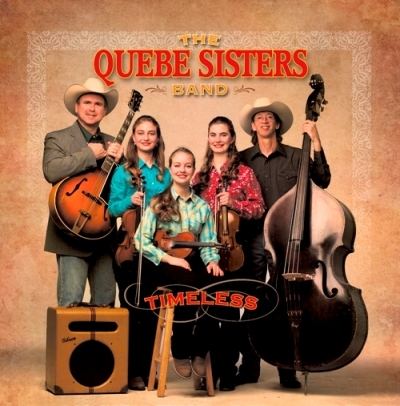 “Timeless,” the second QSB album and first with vocals, was recorded in 2006-2007. Peeples: How many gigs did you play? Were they festival gigs, or…? Grace: There was a festival. Hulda: It was one festival, yeah. Hulda: It kind of acts as a showcase and a festival all in one. Grace: It is, for summertime bands. So, hopefully we will get to go back and do some other events around Europe, and spin off from playing at that festival. Peeples: I’m sorry, go ahead. Sophia: Oh no, I just thought this was really, really neat that — that last song we played, or the song before last that we played, called “Flowers of Edinburgh,” that fiddle tune — we actually took the train from Glasgow, where we were staying, where we were playing, and went out there to Edinburgh, and that place was enchanting. And we saw the castle, and I was like, this song is about this place, so it makes it more fun to play the fiddle tune now that we’ve actually been there, seeing the castle, and it was really cool. It was really fun. Sophia, Hulda and Grace Quebe, with a piece of SKP on the right. Photo: Nadine A. Peeples. Peeples: Back in the states, you guys have been working on a third album for some time now. You previewed a few of the songs from it today. So, what’s the status of that? Are you actually able to get into the studio and get some tracks down? How’s it going? Hulda: We’re going to go into the studio in about a month and sit down and record it. We’ve been working on the material and thinking about it. We kind of like to get everything all ready. Some bands like to go in the studio and kind of create things while they’re there, but we kind of like to do all that beforehand. Grace: At least for this album. Hulda: At least for this album, we’re going to do that. Sophia: It’s kind of our baby. Hulda: I think “It’s a Sin to Tell a Lie” is a definite one that’s going to be on there. The Quebes used to have a short set list. Now, they have so many tunes in their repertoire, they mix it up more. 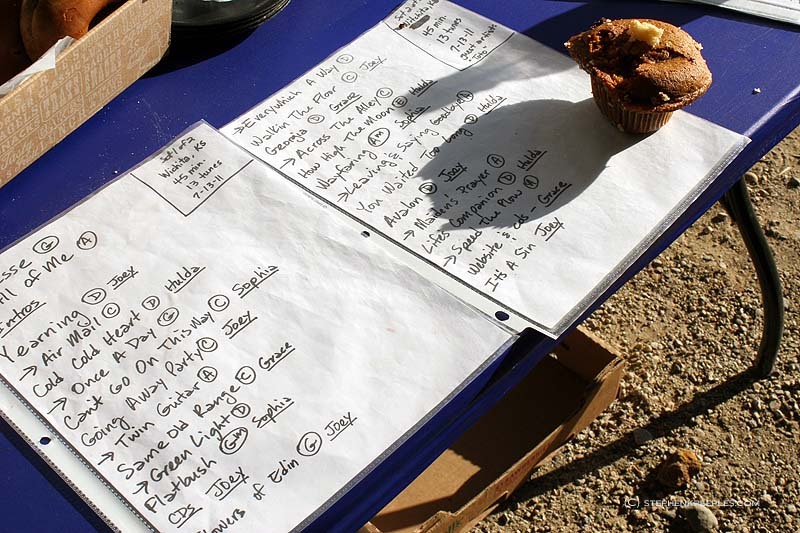 These are Saturday, April 21’s setlist “guides.” Photo: Stephen K. Peeples. Grace: We’ve had requests from our shows. People say, “Oh, do you have that in recording?” So, we’ll have “It’s a Sin,” and I know another one is “Yearning.” “Be My Life’s Companion,” a lot of folks ask if we’ve got that one. Sophia: We have a long list, more songs than we’ll be able to actually fit on the CD. Hulda: Probably “Jesse Polka” and some tunes. Peeples: You’ll have to do some bonus tracks, available online only, right? Sophia: That’s a good idea! Hulda: And we’ll release some singles. That’s not a bad idea. Grace: It would be fun to make a record, I think. Hulda: It would be. One day, yeah. The author with Quebe Sisters Grace, Sophia and Hulda in April 2006. Photo: Nadine A. Peeples. Grace: Like a 45. There are bands that do that. Peeples: Vinyl is not dead. Vinyl is coming back. Grace: Or 33’s, I think. Peeples: I wanted to ask you about your playing. I’ve noticed over the years that I’ve seen you — I see you like every two years, so I can kind of see a jump every time I see you, in the level and the ability and the skill set that you guys have. Grace: Thanks, I’m glad that we weren’t getting worse every two years! QSB on the Melody Ranch Main Stage in April 2010. Photo: Stephen K. Peeples. Grace: It could’ve been the set list we played today. Sophia: …Kind of mixing things up between the three-part harmony and trying to add in different styles. Yeah, just working on the craft of it all, on singing and playing. Hulda: We’ve really been into really trying to break out with our singing more, so we’ve been having a lot of fun trying new things with that. It’s been a great learning experience for us. Peeples: Very good, very good. You guys are big fans of Marty Stuart, he’s a big fan of yours. You played the Opry with him just last year, didn’t you? Or was that two years ago? Grace: It’s been a little while. He had us on the Opry, which was such a big thrill. We played the Ryman, and — that was so cool, that he had us out, and we just did a show with Marty Stuart and The Fabulous Superlatives last weekend, down in South Texas. They were just killin’ it. Sophia: The show was unbelievable. Grace Quebe and QSB bass ace Drew Phelps share a laugh with backstage visitor and fiddle champion Phil Salazar before the band’s Cowboy Festival set on Sunday afternoon, April 22, 2012. Photo: Stephen K. Peeples. Grace: It was so inspiring. We had a great time. We sat on the front row. Hulda: And screamed and hollered and blew our voices out. Yaaaaaah! It was awesome. Peeples: Both of you share kind of the same audiences. His audience is really like you guys, and vice versa. Grace: We like to think so. Peeples: “A Ride With Bob,” the Bob Wills production – have you been doing any of those gigs recently? Grace: We did a run of the play between Christmas and New Year’s in Texas, in the Dallas area. It was really good. They had a bunch of shows, and some were sold out around New Year’s. Hulda: The New Year’s show was a lot of fun. Grace: And a New Year’s party afterward. Hulda and Sophia: That after-party. Grace: So we played, and then Asleep at the Wheel played, and it was really fun. It was a great party. Hulda: We got all of the cast to come up on the stage, and there’s like this funny, silly dance that everybody does backstage, and so Ray says to all of us, he says, “When we do the song, I want everybody up on stage to do the dance!” A couple other actors made up this really funny dance. I can’t do it ’cause it’s only me, but it’s really fun to do it with the whole cast. So, we got up on stage and our whole audience thought it was hilarious. It was a lot of fun. Peeples: Sounds like you’re having too much fun. Sophia: It’s been a really good year so far. It’s only April. Peeples: It wouldn’t be California without traffic, right? Peeples: So, fourth time at Melody Ranch. We’re going to see you again in a couple of years? 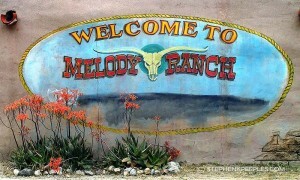 The mural on the wall outside the front entry gate to Melody Ranch looked like this in 2006, but is faded now. Photo: Stephen K. Peeples. Sophia: I hope so, yes. Hulda: We love coming out here. Peeples: Very good. Now, let the folks know how they can find out where you’re going to be playing, and how they can keep track of when your next album is going to be out. Plug the website. Hulda: Our website is www.quebesistersband.com. There’s links to our Facebook page on there, and our Twitter page, and YouTube channel, so y’all check that out, and we will have our new CD hopefully out coming up soon, and we’re on iTunes as well. Grace: We’ll probably send out emails. You can join up on our mailing list on our website, and we will send out the word when the CD’s out, probably in the summer. So, yeah! We’d love for folks to check out the website. Peeples: Great. Really appreciate your spending a couple of minutes with me, and have a great trip. We’ll see you next time. Hulda: Thank you so much. The author with Sophia, Hulda and Grace Quebe at the Santa Clarita Cowboy Festival on Sunday, April 22, 2012. Photo: Nadine A. Peeples. In addition to his “Peeples Place ” blog, Stephen K. Peeples is a writer/reporter for KHTS News (www.hometownstation.com) and SCVNews.com, and host, writer and co-producer of the weekly “House Blend” music and interview television show on SCVTV, community television for the Santa Clarita Valley (www.scvhouseblend.com). A former SCV music and entertainment columnist for The Signal (2004-2011) and drummer with SCV jazz group RainTree (www.raintreejazz.com, 2010-2011), Peeples is a Grammy-nominated record producer (“Monterey International Pop Festival,” MIPF/Rhino, 1992), an award-winning radio producer (“The Lost Lennon Tapes,” Westwood One, 1988-1990) and an award-winning online editor (The Signal website, 2007-2011). For more information, email skp@stephenkpeeples.com or visit www.stephenkpeeples.com.